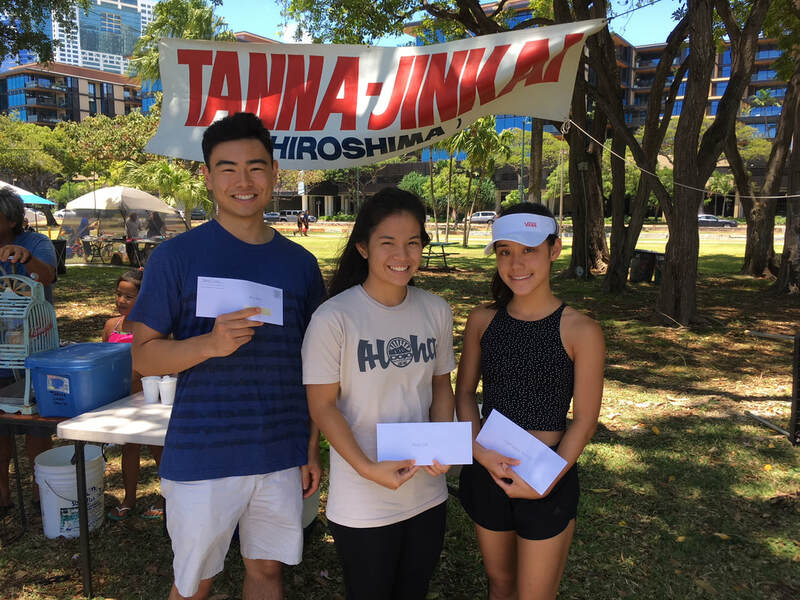 Congratulations to our two 2018 Tanna Jinkai Scholarship recipients Kayla Odo (middle) and Lauren Katayama (right)! Kayla Odo, daughter of Kenton and Kris Odo, won a scholarship of $250. She is a 2018 graduate of Pearl City High School and is currently a freshman nursing major at the University of Portland. In high school, Kayla was active in soccer, wrestling, judo and band. Kayla has a strong family history of winning the Tanna Jinkai scholarship, with her sister Kassie awarded in 2016 and her father awarded in 1988. Lauren Katayama, daughter of Kelly and Sandy Katayama, won a scholarship of $150. She is a 2018 graduate of Aiea High School and is currently a freshman biology and dance major at the University of Hawaii at Manoa. Lauren enjoys ballet, modern dance, jazz and tap. She also has a family history of winning the Tanna Jinkai scholarship, with her sister Kim awarded in 2015.